Stretch Tuesday has rolled around again. Russell and Kitty here, thank you for all of the nice comments on our trip. We had a great time. The photo above is part of our display at ICGA. Last time we wrote about our trip, but what did we find on the trip? Our first stop was the ICGA convention. There were all kinds of wonderful pieces of carnival and stretch glass in the rooms as well the auction. We sat behind Mrs. Tarkington and her daughters at the auction. They are delightful ladies. Since it was our first stop, we purchased very conservatively as we had visions of finding all kinds of ‘sleepers’ at the other conventions and antique shops. At this point, we would like to get on our soap box. Think about the hundreds or in our case thousands of miles that we travel trying to find “sleepers”. Think about all of the computer time that we spend trying to find “sleepers”. Think about all of the postage that you pay for the “sleepers”. Think about the damage that was not noted on the “sleeper”. When you go to a convention whether it is a carnival, stretch, Fenton glass etc., you have lots of glass to look at, feel for damage, no postage, and most of the time very reasonable prices. Plus you can always haggle with a real live person! Glass conventions, give you a unique opportunity to purchase glass. Well at ICGA, there were a number of items that we are still thinking about that we didn’t purchase! Our ‘hind sight’ is 20-20! One piece that we did purchase was a Fenton Bonbon #643 in Persian Pearl. You find Bonbons in most of the colors except for Persian Pearl. Fenton is known for making Velva Rose, Florentine Green, Topaz, and Celeste Blue in almost all of their pieces (such as the dolphin pieces, candlesticks, bowls, cookie servers, etc. ), but rarely Persian Pearl. On the other hand, the Persian Pearl items may be classified as hard to find but they are not valued as much as the other colors. 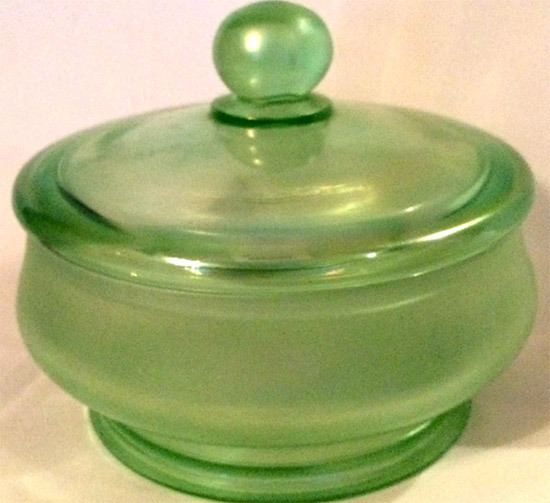 Another Fenton Bonbon that we found in Florentine green by Fenton. You don’t see this Bonbon too often. After Roger Dunham’s talk at the ICGA, we looked at all of the mugs that we saw. This Fenton blue Orange Tree caught our fancy with its super iridescence (which refuses to show off in our picture). We did not have much luck finding anything in the mega antique malls. We did get our exercise which made the trip more interesting. 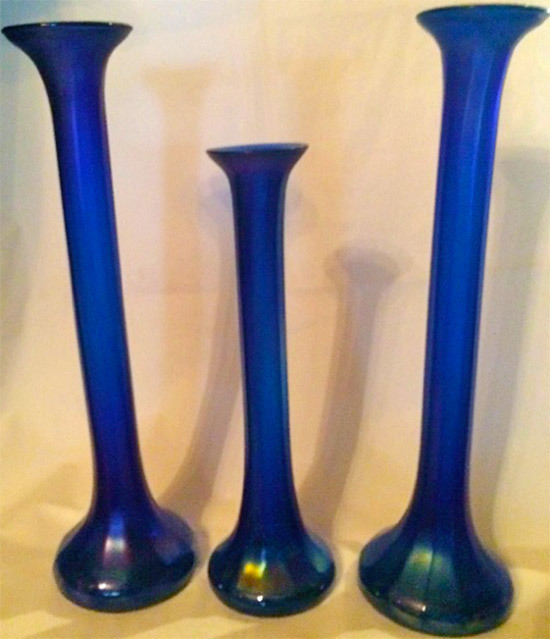 One exception was the pair of Diamond cobalt paneled 12” vases. Last time we went back East, we found the 10” cobalt paneled vases. A marigold miniature server caught our eye. When traveling, small is good. It would probably be classified as a child’s server or maybe a lemon server. 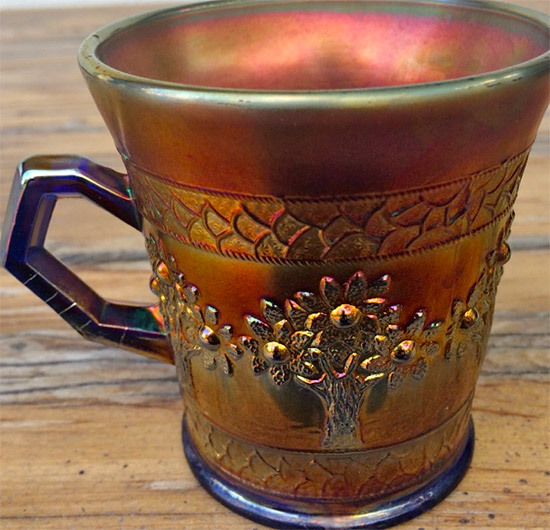 The marigold finish is a “cold finish.” In other words the finish was applied after the glass cooled down. This cheap finish is fragile and can be taken off with paint remover or scrub pads. 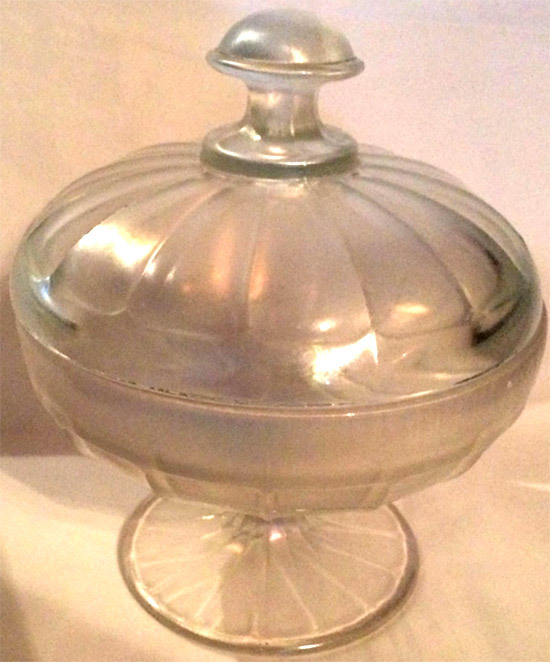 Not really sure who made this server, but would guess U.S. Glass Company based on the shape of the handle. 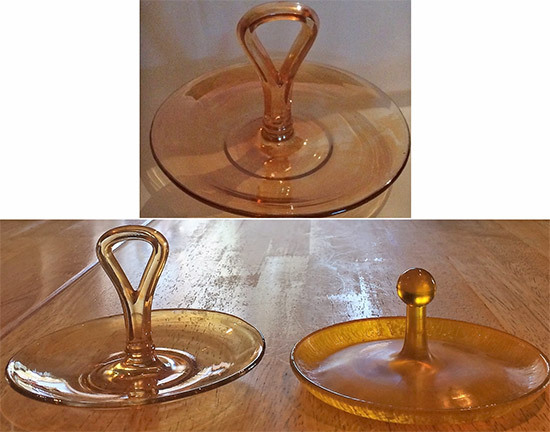 The second picture shows a size comparison with a Fenton tangerine stretch Lemon Server on the right and the marigold server on the left. It does not have a stretch finish so it is carnival glass. Next time, we’ll continue with the pieces that we found on our trip. What have you found this summer? Please share your finds on HOC. With all of the terrible storms on the East Coast, we hope and pray that everyone is safe. We all treasure our glass, but our lives are the most important gift we have been given.